In today’s session, Ooyala’s global IT director, Andy Halvorsen, explained how IT admins can quickly and easily deploy JumpCloud-managed users into their Jamf systems. The in-depth demonstration configured identities in the cloud and subsequently deployed them to Jamf-managed systems. Users walked away with an understanding of how to use JumpCloud’s Directory-as-a-Service® in tandem with Jamf to secure endpoints and streamline IT operations. Halvorsen kicked off the presentation with a brief look at Ooyala, a company that offers best-of-breed online video analytics and monetization solutions that boost revenues from video. Ooyala operates in nine locations. They have nine IT team members that manage the company’s computers, of which 99 percent are Mac devices. While a lot of things work well for their IT team, Halvorsen said it’s important to recognize the challenges, like authentication (LDAP), network access, the remote administration of offices and maintaining budget. But there’s a solution to help IT admins navigate these challenges – JumpCloud. 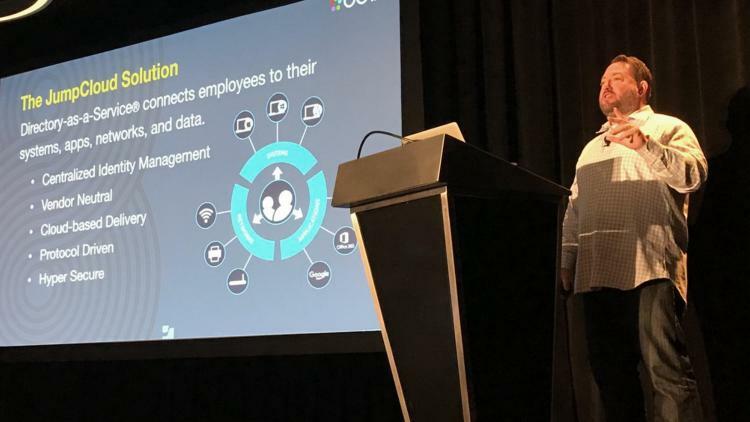 “Directory-as-a-Service connects employees to their systems, apps, networks and data,” Halvorsen explained. As a snapshot it provides: centralized identity management, is vendor neutral, has cloud-based delivery, is protocol driven and is hyper secure. Ooyala was looking for the right solution and to move away from OpenLDAP, one of their biggest concerns was disrupting productivity. “I was able to add JumpCloud without any disruptions to how employees were already working,” said Halvorsen. In short, Jamf and JumpCloud are better together. Halvorsen explained that when positioned appropriately, they make a triangle where things like network authentication, the agent, LDAP-binding and user groups easily flow between the customer’s environment, JumpCloud and Jamf Pro. It’s end-to-end system and user management.